UPDATE: A newer version of this camera is available as of 2016, called DR650S-2CH. NOTE: There is also a Truck version of the DR650GW-2CH, featuring a weather proof rear camera that can be mounted on the outside of a truck or commercial vehicle. This review is about the DR650GW-2CH standard version. 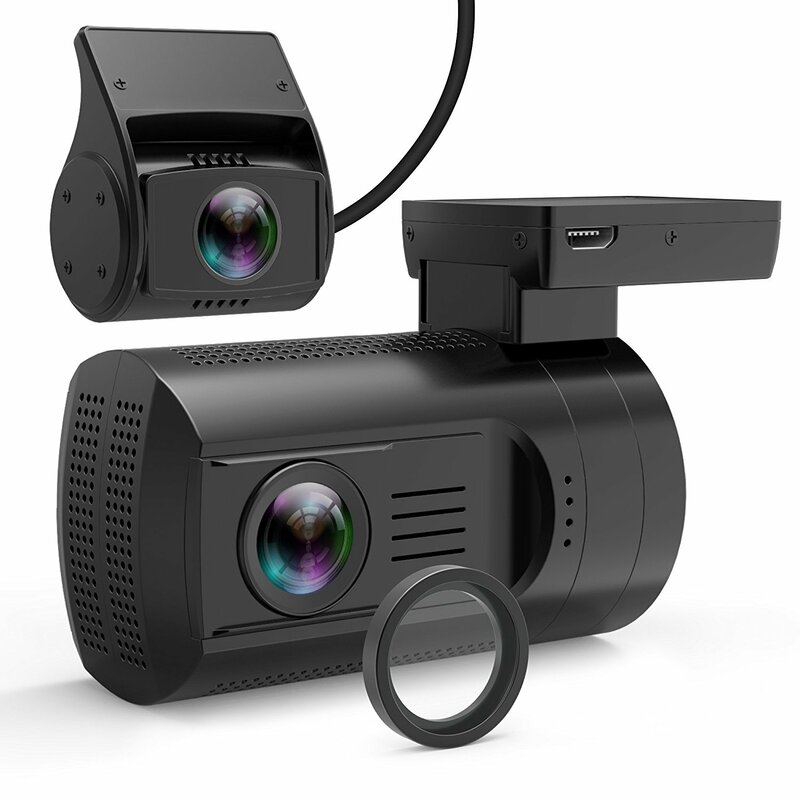 Released in mid 2014, the DR650GW-2CH is an updated version of the highly successful DR550GW-2CH dual channel dash cam system, adding and improving many features while also fixing some of its predecessor’s shortcomings. All black casing: The first thing that strikes the eye about the DR650GW is that the casing is now mostly black, except for the “BLACKVUE Wi-Fi Full HD” logo. The highly reflective silver ring around the lens is now history, along with the grey ring around the camera mount. This is a definite improvement making the camera a lot more discreet. For added stealth, some users like to overpaint the BlackVue logo or cover it with black adhesive tape. 2.4 MP CMOS sensor: The front camera’s sensor has been upgraded from 2MP to 2.4MP CMOS. Reduced viewing angle: The front camera’s viewing angle is now 129° instead of 137°, resulting in a smaller field of view, but also allowing for a less distorted picture. Increased bit rate: The bit rate has been increased for both the front and the rear cameras. With the latest firmware, the front camera now records 10 Mbps, while the rear camera records 5 Mbps. Heat issue resolved: Compared to some older BlackVue models, the DR650GW is far less likely to suffer from overheating. Improved coax cable: The coaxial cable that connects the front and rear cameras is thinner than the DR500GW’s, making it much easier to install. Also, it is available in various lengths (6m, 10m, and 15m), so it will fit in vehicles of any size. Memory card easier to take out: The cap covering the SD card can now be opened without previously unplugging the coax cable, making it easier to remove and replace the card. Better sound quality: Sound recording has been improved with regard to the DR550GW, which sometimes had issues with distortion. 128 GB SD card support: The DR650GW-2CH supports up to 128GB memory cards, allowing for a total recording time of more than 20 hours. Firmware Over The Air (FOTA): The dash cam’s firmware can update itself automatically via Wi-Fi if you have the corresponding app installed on your smart phone. Apps are available free of charge for Android and iOS systems. No more hassle downloading the firmware to your computer first and following complicated update procedures. The improved bit rate, better front CMOS sensor and reduced front viewing angle result in noticeably better video quality as compared to the DR550GW, especially at night. While the older model sometimes suffered from pixelation and varying image quality, the DR650GW doesn’t seem to have these issues. Discreetness has improved due to the DR650GW’s mostly black casing. Also, usability is better as per the varying cable length and easier removal of the memory card. Video recording time has been increased to more than 10 hours, but make sure to get a 64GB memory card with the device (if you don’t need to record for that long, there are also options to buy the camera with a 16 or 32GB card). The DR650GW has extensive features like GPS, a voice menu that makes it easy to operate even in the absence of a screen, and Wi-Fi, allowing you to connect your smart phone or computer to the dash cam for configuration and video viewing. This camera supports buffered parking mode, meaning if a motion or an impact is detected, it will store video from 5 seconds before to 55 seconds after the event. Due to its improved video quality and the apparently resolved overheating issue, we definitely recommend this camera over the DR550GW. There’s also a single channel version of this camera available, called DR650GW-1CH. This is basically the same device as the DR650GW-2CH, but without the rear view cam. Note that it also doesn’t have a port for connecting the rear camera, so should you ever want to upgrade to dual channel, you will need to buy a new device. The difference in between the designations of the 1 channel versus the 2 channel version can be easy to miss. Take care not to confuse the two — if you want front and rear recording, make sure to order the DR650GW-2CH! The DR650GW is now also available with infrared LEDs on the rear camera, making it ideal for use as a taxi cam. Visibility of the interior of the car is excellent even at night time, due to the infrared LEDs illuminating the passenger cabin. Front video is very good at day time. The footage is crisp and sharp, allowing signs and license plates of nearby cars to be read without difficulty. Day time rear video quality is fair. License plates of cars behind are easily readable, however there is an obvious quality drop compared to the front camera due to 720p resolution. Front video quality is good at night time. All details including license plates are easy to discern. Rear video quality is average at night. While not too sharp, you can see what is going on behind your car, and license plates of nearby cars are readable.